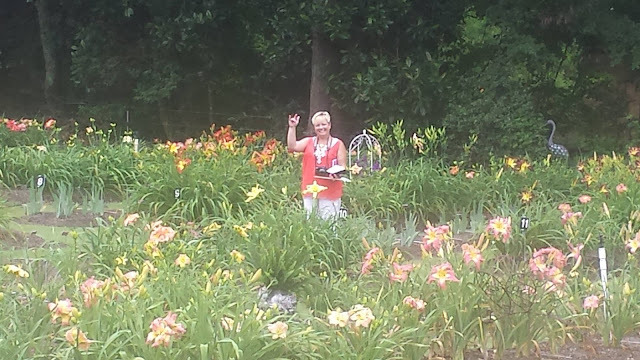 <posted June 17, 2015> This is H. 'Hawkeye Fringe,' a daylily introduced by my friend Don Lovell. 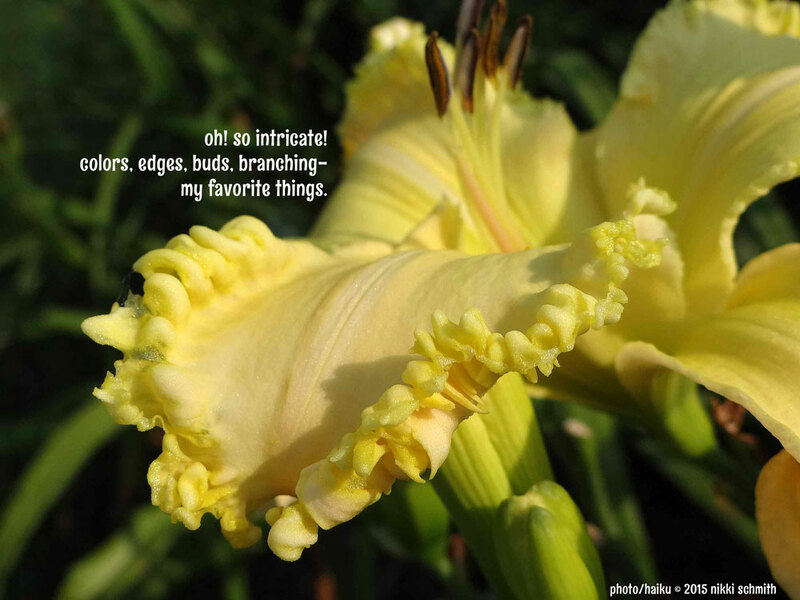 I love everything about this daylily, including its clear color and large, open form. It never has trouble opening correctly here in Illinois and the edges are always well adorned. I especially like the carving that sometimes appears on the petals in the throat area. Yummy. Its raining here again today (5 days in a row now)- lucky for me because it makes me slow down and not feel like I need to flit about the garden furiously doing this or that. The last two days I have simply grabbed the umbrella and meandered in the rain, letting the wet grass soak my feet and gather between my toes. These are the days I have imagined since they were here last, and it feels surreal that they are back again. This Saturday afternoon, I'm hosting a garden party and I'm looking forward to sharing my space with the local women I love so much. Our kids have gone to school together for years, and we have remained thick as thieves. It will be great to relax and serve them my favorite treats and summer peach sangria in my exploding summer garden. Saturday the 27th of June is the Central Illinois Daylily Society’s Exhibition Show at Washington Park Botanical Gardens. Consider this your official invitation to exhibit and/or attend the event. It’s the only accredited show in the state of Illinois and its growing each year. Please come. Email me for more info and check out this website for more info, too! I am decompressing from a weekend filled with a thousand emotions – all of them swirling in my memory as the 2015 National Convention in Atlanta fades into the past. It’s a bittersweet event, really. 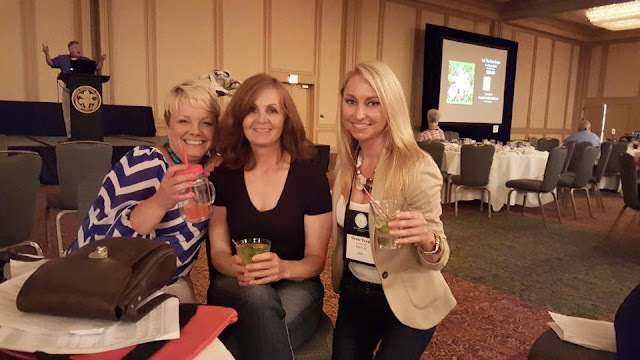 I connect with hundreds of AHS members through Facebook and email and my blog each day, each week, each month and seeing hundreds of them all in one place at one time for a short few days is overwhelmingly amazing. Also blooming its first bloom today in my garden is HAT’S OFF TO SUE (below, right), which reminds me of Tim Herrington and the tearful hug we shared after I presented him with the 2015 Steve Moldovan Mentoring Award last weekend. LOVE IS DEEP is showing off two rainsoaked blooms today, saturated with water and yet not shedding any color. That one reminds me of Georgia and the piece of my heart that lives there. TAVERN ON THE GREEN from my new friend Paul Lewis is showing off exactly how its name implies and GRANITE CITY BELLE has its first flower open, which reminds me of my early days in daylilies – some 25 years ago- as this one was named for and introduced by a lady from my childhood hometown. Sitting across from Bill Waldrop in his gorgeous church made the BBQ lunch served there even more special; he is a true gem who loves this flower like no other. Congratulations to him on winning the President’s Cup for BLAZING CANNONS. I enjoyed some time on a tire swing, lounged on a river bank, ate more than my share of the most delicious lemon fudge handmade by Martha Carpenter, felt a butterfly land on my shoulder and allowed the sun to kiss my cheeks. Sometimes I walked alone, reminding myself to soak this all in. Building new traditions with my partner in crime Theresa Roth and my sparkle sister Elizabeth Trotter was amazing, and I missed sharing space with my kindred spirit Nicole Willis and whooping it up with my Kimberly. I don’t think the world could handle it if we all were ever in the same place at the same time. These people are my family. They have watched my son grow from afar, offered an ear when I have felt like an island and sent a silent thumbs-up from across the room and country to calm my restless spirit. You can count on them to give you a shoulder or a shirt off their back, most often when you don’t even know you need it. Attending a National Convention is exhausting. And thrilling. And soul filling. And refreshing. And worth it all – the money, the time, being away from my own garden and my own family – the collective experience is worth what it means to our community and our mission to GO. AND DO. AND CONTRIBUTE. I'll do it as long as the universe allows, and I hope you will too. You can see a lot of photos from this years convention on many Facebook pages even if you aren't a member. Check out this one or this one. Here’s a cheer to Atlanta, and to everyone who had a hand in our collective experience this weekend. We appreciate you. Deeply. I soo enjoyed meeting you, Nikki! It was certainly one of the highlights of my very first Convention!! Your fun photos sure bring back great memories of a wonderful weekend! I should do my post...lol! Oh, this trip feels like YEARS ago! XOXO, Lynn! Cant wait to see you next year!